Green Killers: Congo’s Miners Dying to Feed World’s Hunger for Electric Cars | Watts Up With That? Also called people with jobs in poor countries in poor working conditions. Called having a job in the third world to make money instead of starving. Exactly. Sadly working conditions in poor countries don’t match our first world expectations. But by having a job they will, eventually, start to participate in the capitalism game. Which is good, not bad. This story is faux outrage. Being dead is obviously good, as long as you died being “part of the capitalism game”. Why can others not see this ? By what flight of the imagination do electric cars cut “carbon” emissions ? They simply move them somewhere else, and since CO2 is a “well mixed gas” the makes not a shyte of difference to anything. Well done SJWs : more pillage and exploitation of black Africa, no gain for the environment. Maybe someone gives her some pills? Yes. My wife is one of eleven. “Maybe someone gives her some pills?” Interesting comment. Why do you think they have so many children? Could be the Congo has no social “governmental safety nets”? A large family will take care of their elders. My dad had 11 brothers and sisters. During the “Great Depression” all able bodies worked to and contributed to the family income just to survive. Some, even after they got married, sent money back to my grand parents. “No, parents not Catholic, …. just passionate hillbillies”. “…just passionate hillbillies.” My wife’s exact words, as well. She’s one of 11 children, almost all of whom had similar size families (all except my wife, that is). When I married her, I became part of a huge and growing family of nieces, nephews, great N&Ns, and great great N&Ns. The work ethic is great among them. Always for killing people with substandard labor in countries we don’t live in, aren’t we? Hatred for humanity and children runs rampant with this. One supposes dead kids and adults are no big deal as long as they aren’t your relatives. Interesting, too, that a job that kills is so okay in some other country. Hey, if it’s good there, let’s fix poverty HERE by having kids break up streets with jack hammers and haul away concrete, toil 6 or 8 hours a day cleaning trash and feces from our streets, etc. They don’t need school. Just money. No more welfare. Put em out there in dangerous jobs. If they die, they save us all money. What’s great for the Congo is perfect for the USA. Stick a cork in it sister. People all over the world die going about their daily work in all countries. No one promised anyone immortality when they were born. And if they did they can’t deliver, you’ve been had. Every person is responsible for the decisions regarding their own personal safety. But if you want to take on all the imaginary Sins of the ever so naughty Western world, and cry a river of tears in vain, as you virtue-signal with the utmost verbal gesticulation, could you please go do it in a basement. Cheers. Humanitarian of the Year award to you. People hater. It seems people haters abound when it comes to killing others in foreign lands—the enviros do it under the guise of saving the world and the skeptics do it just because they hate. What a horrid bunch of useless creatures you are. Why would anyone care what skeptics think about anything when they are all in for killing 8 years olds with hard labor?????? It doesn’t get more vile than this. I am saving these comments for the next time some moron comes around and complains about DDT and dead people. If only we had worked them to death it would have been just soooo wonderful. I am in the basement—my mother’s basement. My deceased mother whose house was sold. Yep, you just up insulting and hating and hope the enviros use you as a poster child for what horrible people skeptics are. I’ll help them on this one. They are so right and you are so evil. They’re pretty sick aren’t they? Maybe it’s because of their naive understanding of the situation. They think they are making a good wage and the taxes/royalties off these minerals are going back into the local economy (“start to participate in the capitalism game”) like it does in Western nations with robust laws, but in reality they are making just enough to afford rice while a handful of corrupt government officials rake in fortunes from allowing a foreign firm exploit the nation’s vital resources. Sure they aren’t starving now, until the mine dries up and they look around to see that none of the wealth went back into their society. But hey, what can we do about it, err well besides have some morality and not buy cobalt from the Congo until they show that the exploitation of the nation’s resources are benefitting whom the resources belong to in the first place – the people of Congo – instead of just a few corrupt government officials and a Chinese mining company. Sheri you’re the archetypal emotionally hysterical virtue-signalling dingbat, pretending to be better than you are, while doing nothing at all, and poking fingers at others, while jumping like a sheep over nothings, and generally needing medication. Got smart iPhoney? Got PC? Got Car? Use hydrocarbons everyday? Fly in aircraft? Yes you do. Sheri, the only one expressing hatred here is you. I’m sick of people peddling guilt. Go make an honest living, why don’t you? Love is an action expressed in doing what is best for another person. Feeling horrified over the conditions experienced by the multitudes living in extreme poverty is not a solution…or loving. It’s just feelings. What actions do you propose, or are already doing, that expresses your love for humanity and provides a realistic solution? Have you lived or are you living amongst the poor, sharing your wealth, providing medical, emotional and spiritual help? Having lived in an impoverished nation for four years, my youthful idealism and emotional reaction was quickly subjugated to the harsh realities of day to day life for the poor. The solutions are not as easy as just sending some money. No matter where you may think the solutions may lie, sending aid to corrupt governments only reinforces the systemic corruption. So what do you propose? And, more importantly for the poor, are you doing it? I am saving these comments for the next time some moron comes around and complains about DDT and dead people. Sheri, right you are, only the miseducated “morons” are complaining that the use of DDT was causing human deaths, ….. whereas the literal fact is, the banning of the use of DDT has caused the deaths of tens-of-millions of humans. Hmm, well I can only speak for myself and I have some care for what others think, which is why I am here reading these words. I don’t have a specific preference for skeptic thoughts although if by “skeptic” you mean independent thinkers then perhaps it is so. These stories and photos are made at great expense by someone, and that someone has an agenda. The $5,000 for a digital camera used to make those photos could certainly feed a family, even a big one, for a month. YOU could feed a family for a month. But there’s MILLIONS of them in the same situation. So, choose for yourself what you will do, then tell your story and inspire others. You’re projecting as WX does no such thing, WX would prefer that concern-troll types did not need to overdose on handfuls of sanctimony pills each morning to cover their hypocrisy then ‘glad’ everyone with their global savior routines, while fishing for serotonin hits. I would much rather such people just grew up some and sought accredited counseling for their mental maladjustments and addictions to epic virtue-signalling. WUWT is not some rehab center for concern-troll fruitcakes, it’s primarily a science blog for interested scientists. The poor here? You mean those that will suffer even more if we follow the lefts demand for getting rid of fossil fuels? Are those the poor your talking about? Did you not notice that is was Chinese companies running the show. Go fuss at them. U.S. companies are not saints, but not the monsters you lump all companies and people in. The bad government in that country is basically at fault for allowing the problems there. Sheri, what’s compassionate about taking away someone’s only chance to earn a living. Once again you have only hatred towards those who expose the false compassion of people such as yourself. Wow, I’m getting to be a little bit disappointed in the WUWT readers’ remarks. Sheri (granted, using a wee bit of hyperbole) was pointing out the inhumanity of the conditions these people suffer. Know what? I agree. From the article “….the Democratic Republic of Congo, one of the poorest, most violent and corrupt places on Earth.” If you’re a minerals investor, are you going to pump in millions – perhaps tens of millions – into a place characterized as the most corrupt on Earth? I wouldn’t. The answer is to implement a government that isn’t so corrupt. If proper, mechanized, orderly extraction of these minerals were carried out – everyone wins. The government, the people, the environment, and the investors. Can’t we agree that would be a preferable outcome? You want us to militarily occupy the Congo and force a new government that isn’t so corrupt? China is the vampire sucking the economic life out of them! We can wish and hypothesize ’till the cows come home but it doesn’t alter the realities in the least. Dragineez, ……. please tell me, why is it that both you and Sheri are extremely concerned about and far more interested in …… saving the lives of teens and children living in the Democratic Republic of Congo, Africa, ……. while intentionally averting your eyes and your minds to the weekly occurrences of bodily harm and deaths of teens and children living in Chicago, LA, NYC, etc., etc. And ps, Dragineez, ……. those Congolese children “work hard” because they are hungry, ….. not because armed guards force them to work. “DUH”, ….. no work, no eat. More of us in the “developed” world should try living hand to mouth. It completely changes your perspective. Also, once you’ve been on the government dole, you will never again wish it on Anyone. Having been there, I insist we get the Federal Power Mongers out of it. We should help our neighbors locally, when at all possible. Regarding this problem, 1 curb the Chinese Communist government’s power, 2 export Capitalism to the Congo. Modern Western companies would see their boards of directories crucified on the front lawns of their corporate headquarters for these types of working conditions. Possibly literally crucified. At risk of stating the obvious, the story Sheri is responding to does that already. As do I and probably everyone else here. Its redundant to hoist the “me too” virtue signal here. Well, get crackin! When you’ve accomplished this, return and report! While pondering how exactly to do that, consider what IS a government. What makes it possible? I suggest it starts with shared values and shared DNA. Family leads to clan, clan leads to nation, and at each step of the way there’s “government”. It arises naturally and cannot be avoided. Take 10 dogs, put them in a room, come back in about five minutes and they will have elected an Alpha. The bloody one is the Beta. Didn’t quite succeed as Top Dog. The one without a tail is the Omega. Every pack has one of those, too. So what about Africa? Well, about 120 ethnic groups if I remember right, very few natural borders so a LOT of territorial overlap among traditionally hostile tribes. They’re still sorting out the Alpha. To be clear, I was voicing a forlorn hope of what should be – not that I think there is a remote possibility of having it happen. As far as turning our eyes to our own domestic poor, I’m assured by the Democrats that they have all the answers. As we all know, the voter plantations are working just fine as far as they’re concerned. There is no WE. I seem to have missed your solution to these problems. 2nd poorest nation in the world. More than 80% live on less than $1.25/day. Average annual income is about $2 nationwide. The mineral industry is rife with corruption there, and armed militias control many of the mining areas. But it’s a feel-good story to you. No one can force them to mine, they could have started any number of businesses, run a ferry service across a river, be a fisherman, start a saw mill, build indoor plumbing, construct houses for people. I’m pretty sure there would be a solid demand for these things. This above article is a propaganda piece from “The Sunday Times” designed to trigger concern-trolls and virtue-signalers, and boy did it bring them out like little piranhas to tout their wares and furiously tisk-tisk and tut-tut. But the primary purpose of this article from “The Sunday Times” is to sell ad-space within a glorified fish-‘n-chip wrapper so that more Apple iPhoney’s can be sold to more hand-waving maladjusted misanthropic concern-trolls. Uneducated peoples aren’t going to know anything about that. A saw mill or a ferry? They probably don’t know what a saw even is, let alone how to build one, or how to build a ferry. Rubbish, who do you think you’re trying to kid? Did hundreds of African cities grow all by themselves without human assistance? It’s not the responsibility of others to educate them, it’s their own responsibility to educate their children. Do you think people on the other side of the planet are responsible for it? We did that during the Colonial era, invested heavily in it. We invested heavily in the UN for 70 years thereafter, and apparently to no effect … according to you. Uneducated peoples aren’t going to know anything about that. A saw mill or a ferry? Kyle, not only Upstate NY, but down state NY, NYC and the rest of the colonies were settled by mostly uneducated people ……. that educated themselves and America prospered without a constant flow of money, goods and educational expertise from the well-to-do civilized countries of the world. Kyle, if the early immigrants to America could create a highly productive, civilized society, on their own, …… how come the Palestinians haven’t accomplished a damn thing after 60 years and billion$ of FREE dollars of US taxpayer money, including FREE educational and technical support? Sounds very much like living conditions less than 150 years ago in what is now the richest country on this planet. What would we be saying about the abject poverty of gold rush miners living in muddy shacks without running water. And, sofas!, hah! They were lucky to have an iron stove heater. Or we could berate the coal miners of Europe or Appalachia. I’m with Kasper on this issue, however, it’s high time the hypocrites of ‘green technology’ actually get a tour through the sausage factory. True . Great Colorado coal miners strike… 1914 or so . Ludlow massacre . USA has improved a lot in 100 years . Hope Congo improves faster . Your description reminds me of Clint Eastward’s movie Pale Rider. Actually, thinking about it; Pale Rider has all the hallmarks of the same story, just without the hero at the end. Yes … but those miners were not conscripts, enslaved by an overlord. They were FREE men, looking to make a fortune from the bounty of the earth. They actually HAD an upside to their toil … no so for the dirt poor African children. There ends your feeble analogy. I demand … “climate justice” … I demand a return to coal power where gigantic machines do the work of 500 men. All powered by petrol. And I demand all the filthy rich Tesla drivers in Palo Alto personally PAY the medical care for these dirt poor miners. They need to PAY for the clean air … in their neighborhood. We should be compassionate towards them too. If the mines were in the US, they would use big machines, mine safety would be regulated by OSHA, and you wouldn’t see stories like this. The main point is that stories like this should make those who tout BEVs as planet saving should get off their moral high horses and worry about the human cost of their virtue badges. These miners are working for themselves, not for some large mining company. If you forced them to stop, I don’t think there life would improve. How many beryllium miners died in the seventies for my listening pleasure? Nothing changes. First, beryllium is non-magnetic, You are probably thinking of neodymium, which is a “rare earth”. Second pure metallic beryllium is toxic when ingested, especially if it is inhaled in in a fine powder. However, beryllium is found in nature only in complex silicate minerals which are not ingested. Those minerals were mined in the US and the Soviet Union, not in Africa. I had no idea beryllium was related to listening pleasure. Perhaps I missed something! Shure you missed something. The V15. I think our Anneke (and GWPF) is/are a bit late to the party…. In an attempt to counter lower lithium extraction volumes from DR Congo, mine operators worldwide had increased their output, to the effect that global prices are falling, with a ‘normalization’ of the market not in immediate sight. *There* is the reason she is starving – the cobalt companies have moved elsewhere. Nice looking house Solange has got there………. If only we could utilise Photoshop and ‘bleeding hearts’ to Power The World eh. By the way there aren’t really any “cobalt companies” since cobalt is usually produced as a by-product of copper or nickel mining. Those diggers in Katanga are just about the only “cobalt companies” there are. A primary cobalt mine is about to open in Idaho. It probably would have been open years ago but I imagine there were hundreds of lawsuits by the Lorax. they might be selfemployed Jeff and Donald, however if they were paid DECENT sums for what theyre supplying theyd have a marginally better chance of surviving longer eating better etc. consider what the endprice per tonne is? and thats set by the mining companies using machinery and running costs to cover..
then see what these people get for the same. as for UK having 125 mil leccy cars..isnt disposal of those going to be an eco nightmare..those that dont self immolate anyway. decent old engines can go for decades and be repaired reused and repurposed, the new crap has short life spans huge repair costs and little value over 200k useage. something very wrong with the mindset of the buyers I reckon. Tesla buyers have a totally different mindset. Our neighbor got his model 3 a couple of weeks ago. He buys “green” electricity and pays the kWh about 30% more than what we do. Somehow funny, we are all hooked to the same transformer station. So normally he should expect to have a car built from clean “bio” cobalt produced with the greatest respect for white bears. Or sorts. Tesla – pretty toys for rich boys. Now, I think the few I’ve seen are gorgeous to look at and fascinating to watch, but I cannot imagine why our Government has to subsidize vehicles that only the top 1% of society, financially speaking, will ever be able to touch. Of course I understand why the top 1%, and Elon Musk, want the subsidies, that’s not tough to figure. but why do the rest of us give them our money without even questioning it? This one is build in the Netherlands. With variable gaps, shaky hatch with about 8mm of up/down play in the closed position, leaky doors and reportedly a full set of surprise error messages that require a guy in a discrete service VW van to show, open the front trunk and disconnect what looks like a 12 car battery. Apparently not a deterrent to the enthusiastic owner who lives well with all issues “inherent to a supercar” hat costs “only” 59’000 Euros. Time to protest against “Blood Teslas”. The buyers aren’t going to be given any choice in the matter and will be just happy to get the cars your government dictates they should have. Similar to the US issue with California. To me, the real question is why do the Elites not want people moving around the countryside? The open countryside is for the elites only, don’t ya know! The unwashed masses must stay in overcrowded cities. Because they want them impoverished, demoralized, and humiliated. If somehow buyers were forced to pay to pay more for what is mined by the self-employed, the resultant higher prices would simply justify mining companies expanding their operations, putting those self-employed miners out of business completely. They exist solely by their ability to undercut the prices of the big companies. 99% of the world have an annual income of less than $35k, per year. The answer is not for the ‘evil 1%ers’ to pay more, or to redistribute wealth – that just leads to shared poverty. The solution is to increase the wealth of the world. That is what is beginning to happen (it will soon snowball as it did in all industrialized countries over the last two hundred years, or so). Those in the Congo have been fighting a constant battle of starvation. This industry is bringing more wealth into the country, regardless of how much it is paying (clearly, it is paying more than any previous economic activity). Eventually, food needs will be met. Then they can start addressing other needs – water, sewerage, ELECTRICITY. Once basic needs are met, they are in position to grow wealth quickly. They will have the CAPITAL to invest in other economic activities. The only threat to this is government instability. If they do not learn how to govern themselves, then there is no hope for them, regardless of what we do. But the bottom line is you must boot-strap the wealth of a nation. Other countries can’t do it for you. Why the rush to electric cars? We do not have the infrastructure so support everyone driving an electric car, we so not have the power plants to supply enough electricity for everyone to drive an electric car. Do people understand coal and natural gas are the two biggest fuels used in producing electricity? Coal pollutes, and if you want to be able to heat your home, water and cook natural gas is not the solution. We refuse to let nuke plants be built. Wind, solar, and tidal power will never be enough. One hope might be geothermal, but it has it’s problems too. We rush ahead without considering the consequences. Rolling brown outs and blackout coming to you soon if this craze for electric cars continues. There was a time when runways didn’t exist for all the new aircraft too. It also wasn’t a problem. Well, let’s see – I am looking out my front window onto the my street and I don’t see a single runway or any private planes….same thing on the adjoining roads and streets. In my county (which is mostly rural) there are a few private runways, probably some of those for farms that need crop dusting done and the rest just wealthy private owners with a pilot’s license and a single engine plane. And then there are a couple very small regional airports that can handle nothing larger than a small private jet. But by contrast there are cars, trucks, motorcycles with roads for them to travel on (and driveways to park them) just about everywhere…. In other words, air travel is something that far fewer people have private access to (meaning they own the plane(s), hangar and runway) and public access is at centrally located hubs near cities and urban areas. Building runways and airports for commercial air travel is in no way comparable to private ownership (+storage and fueling) of personal vehicles. Nice troll Lee, the same applies to boats for which there were no docks built, or sail cloth or outboards. Or cars that had no roads, or fuel infrastructure, or stoves with no chimneys, until they were also built. It is a BS argument to claim something is not possible simply because infrastructure has not been made yet. Building the infrastructure for mass adoption of electric cars is a lot different than just building things like runways and airports for airplanes. The greens do not want to expand the only viable technologies that can power electric cars (fossil fuels and nuclear). Instead they claim we can do it with wind and solar power, which is ludicrous. We can’t power the current economy with those, let alone the current economy plus tens of millions of electric cars. Do you spend a lot of time listening to greenie ‘planet-saver’ types when planning to do anything practical, technical or functional? No? Nor does anyone else who’s interested in success. early aircraft could land in a field or country road. maintained runways preceded jet aircraft which needed them. Hybrid cars make sense, when you count the tax breaks. I just bought one. I love it. Substitute the British Isles for the Congo and 200 years ago, and it would have been the kids working in a coal mine. Nothing much has changed, except for time and location, although the Congo was the product of a very dark Belgium colonialism past under King Leopold II. Sort of like the present day EU form of government that Brussels has become 200 years later, without the child labor. If people were genuine in their wish for cleaner air, I would think that a better and more controlled method would be to mandate tighter values for air pollution from cars each year. Manufacturers would have time and the inventiveness to come up with solutions to produce vehicles that have less emissions of any chosen type. We have developed particulate filters, adblue, exhaust gas recirculation, why not let industry continue to innovate to meet tighter and tighter targets. We know most countries do not have the electrical infrastructure to support mass electric car rollout, so why do politicians suggest it in the first place? Perhaps, in time, electric vehicles may be the only solution to large city pollution but the current “lets get rid of petrol and diesel vehicles with in a few years” is causing chaos in jobs, engineering, the environment etc. Here’s a link to USA off-road diesel engine regulation information. EU regulations are much the same. In places such as LA, the air coming out of the tail pipe is cleaner than the air being breathed in. Cars are already clean enough. Print copies of this piece, keep some with you when out, and about to pop under the windscreen wiper of any parked electric vehicle!! Merely collateral damage to a green ,if they were mining coal there would be massive outrage . So did WaPo back when they were a real news papers. 600 million EV’s would consume 907% of the world’s 2015 proved lithium reserves and 615% of the 2015 proved cobalt reserves. David, are we saying the Club of Rome was right with respect to EVs, but with regard to nothing else? Either they were right, or they were wrong. I think we both know which. The Club is wrong. Up until big battery lithium demand, there were only about six producers worldwide. There are presently 400 projects being evaluated. What is needed will be found. 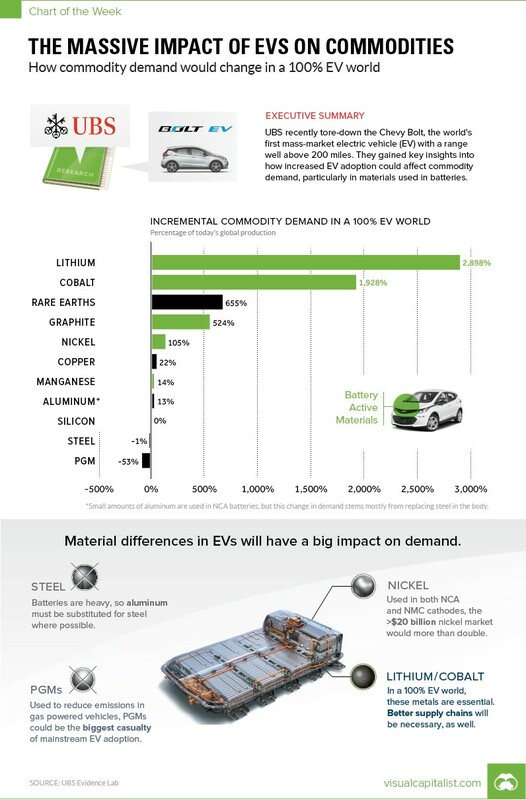 Lithium is easy enough – there are plenty of unused reasources. Virtually any salt flat in the Andes hold large quantities. Cobalt will be much more difficult. There are large potential resources but they are very low grade so prices (and energy consumption) will be high. Not yet really explored for. Just going back to the heritage cobalt dustricts. If there is a dollar to be made, there will be new resources developed. BTW, Quebec and Ontario are loaded wirh hardrock lithium and Katanga has the worlds largest hardrock lithium that dwarfs all other resources. We’re not going to run out of cobalt any time soon either, humans just mine the most economical deposits first. The conditions in the Congo reflect that there are no real property rights in the country. Obviously, a more industrialized mining operation would be much safer, but as the country is in an ongoing civil war, no one will make the investment they cannot be assured of keeping. These small cobalt veins are almost certainly not worth mining on an industrial scale at current prices. The industrialized mined cobalt in Congo comes as an accessory product of copper mining. The problem is artisanal mining, which is individuals essentially mining by hand. In Brazil they are called “garimpos”. The mining laws have to be changed such that it is mined more efficiently. Colombia did this some 25 years ago in a gold region adjoining Brazil. Of interest is that mining law in England has a long and important history. Particularly in Cornwall and Devon where tin mining goes back to Roman times. Stannary Law developed to protect miners and their ownership. The Wiki does not include it, but I have read elsewhere that in 1215 when the nobles wishing to constrain King John’s ambition needed a legal framework. And the best existing was the Tin Laws, which provided the basis for the Magna Carta. Well Green EV owners will need the holes to bury their dead batteries so wouldn’t that make it fair trade cobalt? I think they call it sequestration. A skeptic hatefest. How charming. I’ll refer all the enviros to this comment section when they skeptics are greedy, hateful people. Sheri, there aren’t an oversupply of diplomats on this site, but, with repect, you have been taken in by the old recycled blood diamonds and “coltan” whitemen are real bad dudes story. Artisanal miners are a very independent industrious type. Yes, there has been forced labor by warlord types, but 90%+ are free operators making life better for their families. The photo of Ms Kenena is of a well dressed woman in a fine house. Once again Sheri demonstrates that she has no tolerance towards those who point out the futility of her virtue signaling. Sheri seems to believe that the way to improve the lives of the poor is to take away from them the only means they have of feeding their families. Hello Sheri, okay do you and fellow enviros want to help these people in the Congo? I mean really help? First take a look at the picture, what is missing in the mine, the most basic thing. Lets see you and your mob could start with printing up safety pamphlets of small scale mining for them. In their language. Also see about getting some mining engineers to talk to them and see what they need. Oh but first Sheri tell us what is wrong with the picture. Other then the fellow in said picture is giving death a kiss. Not with angry or malice but it does no good to just get indignant and judgement. many people here have worked in environments that are quite dangerous. You take your chances. This “greedy, hateful” skeptic treated myriad conditions and diseases in Liberians as a Special Forces medic. Mothers brining their Malaria fever spiking babies to me covered in mud. Stuff like that. What have you done Sheri? We, that being us two SF medics and the Army PA serving at the US embassy in Monrovia, did that on our on initiative during our own off duty time. The DoD medical system supplied the supplies of medications, steripacks, etc from stocks that were about to go out of date and the rest was from the nonexpendable equipment which SF medics are issued. We packed it all in a small CONEX that flew over with us. Treated all kinds of stuff for indigenous people in the third world. What have you done for the poor of the third world Sherri? I’m disappointed that the GWPF published this type of report. Most of the cobalt is mined by large international mining companies (like Glencore) and these are state of the art operations technically, environmentally and in occupational health and safety and they provide good jobs for local people. Canadian operators and I’m sure US ones are obliged by law of their respective head office countries to employ American and Canadian standards for health safety and the environment in ops abroad. Artisanal miners are indigenous private operators who have secured their mineral lands and sell their produce to the big companies or other buyers. There is no control by foreigners. Regulations or lack thereof in these matters are the sole responsibility of the Congolese government. These people are the industrious ones in the community, like the gold rush miners of earlier times. Solange Kanena has my sympathy for her loss, but looking at her home and clothing it is plain to see that her husband provided well for his family with his hazardous labour. If he was the mine owner, they still will be provided for. This is the same old, same old recycle of Blood Diamonds and “Coltan”, implicating white chatlatans. I have seen these types of ops in a number of countries and they provide a lot of economy at the community level in areas with gold, diamonds, tin, tantalum. I evaluated a gold prospecting lease on offer by the government in northern Benin a number of years ago for a Canadian client company. It included lode gold showings in the higher country and a downsteam, broad valley alluvial gold area some 3km long and 1/2 km wide. The latter was dotted with small artisanal workings and my assessment of it in only a few days fieldwork consisted of visiting the miners – individuals or pairs, measuring a day’s worth of gravel washed and weighing and buying their gold for twice the price. I similarly did evaluation of a tin lease in Nigeria for an indigenous miner (I was a geol with the G Survey of Nigeria with part of my work to assist indigenous miners). I outlined the deposit and built them my upgrade of a large “California Rocker” with a water pump. Other assistance to artisanal miners there included for alluvial saphhires a china clay deposit, etc. These folk are very independent and industrious. It’s OK Gary most of us here know history and the sacrifices of our ancestors for a better life. Just holding up a mirror to the virtue signallers and their expensive BEVs saving none of their dreaded plant food with whole of life considerations. Com’on mods, my posting is a personal experience one dealing with artisanal miners in Africa and telling who these people are. Very appropos. What hunger for electric cars? Don’t they still need subsidies? ‘Having a job in the third world is better than of starving’ is employing the logical fallacy of relative privation: ‘trying to make a scenario appear better or worse by comparing it to the best or worst case scenario’. In other words ‘nothing matters as long as it is not the absolute worst thing that can happen’. I think you have applied the logical fallacy wrong. This isn’t “better than the worst case scenario”. The option to mine cobalt is “better than if they didn’t have this option”. Interestingly, a recent Yahoo commenter linked to a couple of articles claiming that the miners (especially the children) were at risk because of the toxicity of cobalt. It is true that refined cobalt is fairly toxic, especially as an inhaled dust. The problem is that the miners aren’t actually mining cobalt. They are mining sulfides and arsenides, which are not particularly dangerous, containing cobalt as the main cation in the compounds. The articles were very short on specifics about the claimed toxicity and even the particular minerals that are being mined. But, it seems to be a red herring. I can’t help but wonder why there are suddenly several articles coming out about the hazards of ‘cobalt’ mining. The comments here really take the cake. I’m outta here–deleting bookmark. The internet brings out the worst in people, or maybe it just brings out people the way they really are. Maybe you should think deeper, to the roots. Wackogreens demand clean world. “Easy” way is to stop driving first. Then they show green light to electric cars, because electric is clean and it´s coming from the “wall”. They have no thoughts what these clean cars need. They do what they say. Wackogreens don´t care the casualties in their fight. They are ready and willing to sacrifices, if they are not touching them. We have already very clean cars. But it´s not enough, nothing is. I respect people who live as they preach. Very few greens do that. They don´t care human lives as long as their needs are fulfilled. And their needs are the only valid needs, because they care… themselves. Radical greens take their message from “mein kampf”, literally. The more power they get, the closer we all are to the final solution. And that´s not going be a peaceful solution. Maybe here are some harsh comments, but this situation on this planet is making thinking minds very cynical, because there is no light in the end of the tunnel anymore. The local politics aside, if there was cheap energy available (coal powered plants?) then these people likely would have mining jobs but wouldn’t be working in such horrid conditions. The last is in Africa. (I think the Congo?) Political instability made it impractical to mine the coal. If I remember correctly and it was the Congo, ….. There is a potential American source of cobalt. I had the good fortune to visit this site in the Salmon Mountains in Idaho around 1995 when they were drilling cores to characterize this deposit, so the effort had been underway for a half dozen years already and now, 20 years later, the mine is permitted. This is the kind of delay that we tolerate in accessing such strategically important minerals and actually that is one of the shorter timelines i’ve seen! Ironically, the flush of ‘artisanal’ mining in the Congo means that prices are low as production is marginally greater than immediate demand and the economics have this project in a holding pattern — about ready to mine but not digging. With some qualifications, this ‘artisanal’ approach reminds me a bit of opal mining in Coober Pedy, everybody just starts digging. Under a chaotic and barely functional government, I’d be the last to deny to such desperate people this medium of exchange they can gain through such make shift undertaking, even so dearly acquired. One can hope that self emergent best practices can mitigate the worst risks although the battle for the safest and most responsible mining in the world here in the United States did take a life before a single commercial ounce was returned from this American Cobalt Project. One of the engineers and sweat equity investors in this effort who was a close friend and facilitated my visit there and my understanding of mining law and practice in general and the Idaho Cobalt Project in particular succumbed early to a health predicament that was surely exacerbated by years of fighting the same green behemoth – from their favored pretextual use of the endangered species act to impossibly precautionary lawsuit style regulation over mining operations to produce the very commodity that the same behemoth now requires in gross, even as it ignores the human toll in the Congo. I can only hope him remembered when this production finally starts as someone who had the vision to swim against the stream. So, poor people, with a corrupt government (to the extent that it even functions at all), are exploited by a ruthless foreign power (China)…not really news. Tragic to be sure, but not news. I wish there was a quick, easy way to stop this from happening, but there is not.